More Sunday Law Info Coming Soon. Stay Tuned! Shifting political ideologies about social issues has also played a role, with fewer Americans comfortable with the rhetoric of their religious leaders. As the ‘nones’ have ascended, the number of mainline Protestant Christians has fallen 62.5 percent since 1982, to now account for just 10.8 percent of the U.S. population, according to the survey. The number of Catholics has gone up and down over the decades, cumulatively decreasing more than 4 percentage points from 27.3 percent in 1972. However, that indicates an overall stability for that religion, despite the decades of sexual abuse scandals that have plagued the Church, Burge said. 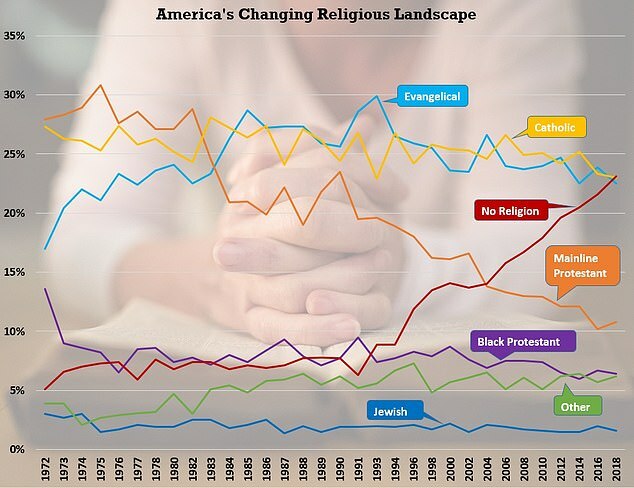 Burge said that America is on a trajectory to become increasingly less religious going forward – following a pattern that has already emerged in Europe’s most developed countries, including those in Scandinavia. Burge has seen the overall shifts first hand in his role as a pastor at an American Baptist church. Copyright © 2019 The Advent Message. All rights reserved.